Amir Khan's next fight will be against former world champion Julio Diaz in Sheffield on 27 April - his first contest in Britain for two years. Khan's last home bout was a six-round win over Paul McCloskey in 2011. He most recently fought in December when, in his first outing since defeats by Lamont Peterson and Danny Garcia, he stopped Carlos Molina in Los Angeles. Olympic bronze medallist Anthony Ogogo will make his pro debut on the same bill, as will Khan's brother Haroon. Mexican Diaz, 33, is a former two-time lightweight world champion who has 40 wins from 48 fights, with 29 knockouts. But he last held a world title in 2007 and has lost four and drawn one of his last 11 encounters. Northern Ireland's McCloskey told BBC Radio 5 live that failure to beat Diaz could spell the end for Khan's boxing career. He said: "If he got knocked out by Julio Diaz, that would be a career-finishing knockout. Diaz was a good boxer years ago but he's not the fighter he was. "If he [Khan] got knocked out by him a lot of people would be saying it's time to hang up the gloves - but I would be very, very surprised if that happened. Amir should have enough to beat him." McCloskey is still angry that his fight against Khan was ended by a cut above his eye following a clash of heads and said he would relish a rematch. "Contact has been made but we haven't heard back," he said. "I was happy with the way things were going [in the fight]. If the cut hadn't have happened, who knows what would've happened?" 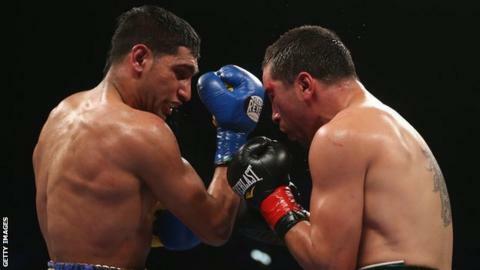 Khan, a former light-welterweight world champion, struggled to sell tickets for his last fight against Molina but the Bolton fighter will hope to fill the 12,000-capacity Motorpoint Arena. The 26-year-old's promoters, Oscar de la Hoya's Golden Boy, are looking to make inroads into the British market, hence the signing of 24-year-old middleweight Ogogo.